This entry was posted in Invest Money Practical Advice on Investing and tagged investment platform on June 19, 2015 by MG. Many people living in Britain complain that they are charged a far higher price for products and services than their friends living abroad.They call it rip off Britain – and for the right reason too. The trading and investments industry is not immune to this high British pricing as well For too long investors in the UK have paid high commissions to buy and sell stocks. The current prominent platforms charge a range of fees from the premiums of Hagreaves Lansdown and Barclays Stockbrokers which charge £11.95 a trade to the execution only brokers like XO and iWeb which charge £5.95 and £5 commission per trade. Many of the current platforms also charge an annual platform fee as a percentage of your net investments thus adding insult to injury. Whilst many of the premium platforms like Hargreaves Lansdown charge a reduced fee of £5.95 for frequent traders (those who trade on more than 20 occasions per month), this fee is still high. And many average investors will never get this ‘discount’ as they are investors rather than frequent traders. But thankfully, a new platform called Degiro has come over from the Nethrlands has blown all the other platform out the water. 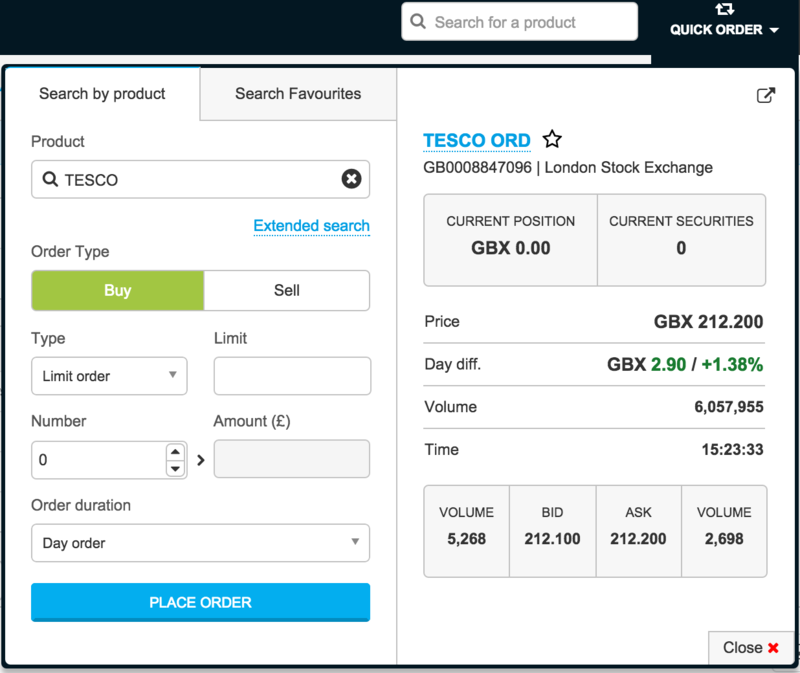 Degiro claims to currently charge the lowest trading fees of all platforms in the UK – but a new platform called FreeTrade will be the lowest cost when it launches in the second half of 2017. With all the buzz around De giro, I decided to open an account with them and give a review their platform here. Update: Degiro will no longer be the cheapest platform when Freetrade launches in the second half of 2017. With degiro, you can invest in most of the prominent markets across the globe. A full list can viewed at the following link https://www.degiro.co.uk/products-and-markets.html. (If you want to research stocks before you buy them, read my review of stockflare – the website that allows you to research and compare stocks). If you buy shares listed on overseas exchanges, there is also a connectivity fee. So if you buy shares listed on the New York Stock Exchange,you will pay 0.25% of your total portfolio value (with a maximum charge of €2.50). Keep this in mind when buying shares outside the London Stock Exchange. When dealing in foreign products, your money will have to be converted into that foreign countries currency. De Giro state that they use AutoFX as standard for this currency conversion. AutoFX will convert the exact amount of GBP into foreign currency at the time of execution. If for example, you would like to buy American shares for USD 3,000, the AutoFX facility will automatically convert the exact amount of GBP required to complete the transaction in USD. This means you do not first have to conduct you own currency conversion. Low fees – it has a cost structure that no current platform can compete with. But Freetrade will be cheaper once launched. Investing in fractions – Degiro will soon provide the unique opportunity to invest in fractions of products. You could for example, buy 0.100 of a share in Google. If you were to do this for the entire NASDAQ, your portfolio would contain the equivalent of 0.100 of the Index. Ideal for investors with smaller portfolios who would like to spread their investments effectively. No Hidden costs – It’s free to open an investment account with DEGIRO and once you do, you’ll have immediate access to unheard-of low fees. DEGIRO’s pricing structure is simple and transparent with no hidden costs, so you know exactly what you are paying for and when, avoiding any unpleasant surprises. No analysis tools as you might expect from a discount broker. No trade confirmations – When orders are executed there is not such thing as trade confirmations in your mail. Everything is just on the platform itself. To deposit money, you can not do a simple debit card payment but you have to instead do a transfer from your bank to theirs. Read my review of the best investment platforms in the UK for new and experienced investors. People that have previous investing experience and know what they are doing: As Degiro acts as an execution only broker, it does not provided analysis and research. Thus if you know what you are doing and know exactly what stocks you want to buy, Degiro is the cheapest platform out there. Traders: Degiro is good for frequent traders due to its low trading charges. People that need prepared research and analysis – If you require thorough research and analyst reports, Degiro is not the best platform for you. You would be better off at a premium platform such as Hargreaves Lansdown. Degiro are currently doing a promotion whereby you get £20 if you sign up using this link. , I decided to take the plunge and opening an account. The account opening process is done online and it is straightforward – much like any other investing platform. Complete an appropriateness test – to ensure that you understand the risks of investing with financial instruments. Agree to the conditions of the platform and the conditions for real time prices. Transfer money into your account – This can be done by direct deposit or manual transfer via online banking. (note that if you don’t click on direct deposit on the first instance when signing up, you will need to do a manual transfer as Deniro has no feature to override this.) And this is the only stage you can do a direct deposit as any depots after this has to be via a manual transfer. 3 steps you need to complete before your account can be activate. Click on picture to enlarge if not clear. Once the the above three steps are complete, your account will be activates. Once logged into your account, the platform looks good and is easily navigable. As a ‘discount broker’ I was happy with the user friendly platform which I did not expect at all (though I still prefer Hargreaves Lansdown for its ease of use). There is a tab at the top of the pages labelled prices. By clicking this, it will give you prices of all the different assets you are able to invest in. There is a screen shot I took below showing stock prices for the FTSE 100. (Click on the picture if it is not clear). Using the DeGiro platform. Click on the picture if it is not clear. Buying stocks is easy with degiro. Click picture to enlarge if not clear. I have so far had a positive experience with Degiro. The platform is easy to navigate and you can trade stocks effortlessly. I have so far found the customer service to be good as whenever I have asked a question to them via email, the response is always quick and to the point. Furthermore, I am drawn to the fantastic pricing structure. Whilst I will continue to use de giro to invest in stocks, I will not be moving the bulk of my portfolio here just yet. Not offering an ISA account is a big drawback for them. I will use Degiro for the overseas stocks I intend to invest in which can not be held in an ISA wrapper (with any platform). 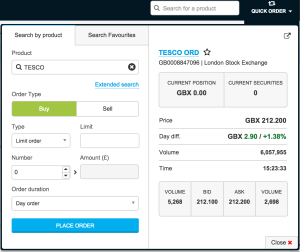 So far Degiro has lived up to its word as it is is hands down the cheapest way to trade stocks online in the UK.